WonderLookPro is providing various color correction methods. 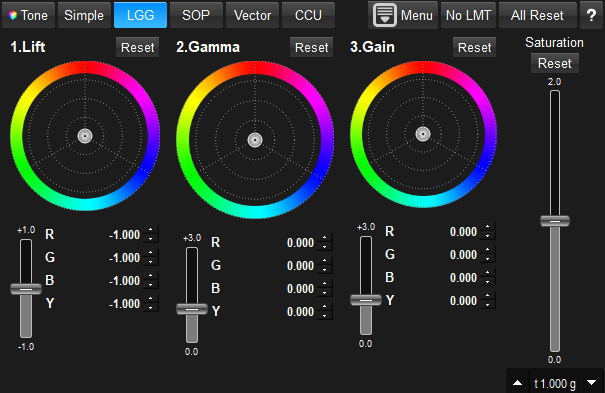 User can create his/her own color by using tone curve, ASC-CDL, vector color or other interface. WonderLookPro also provides half automatic color correction methods, like gray balancing or matching of specific color. ・You can choose the shape of default curve from straight (Grading Space mode), or System Tone Curve(System Tone mode). ・You can choose color selection for the tone curve. RGB mode control the curve for RGB simultaneously. 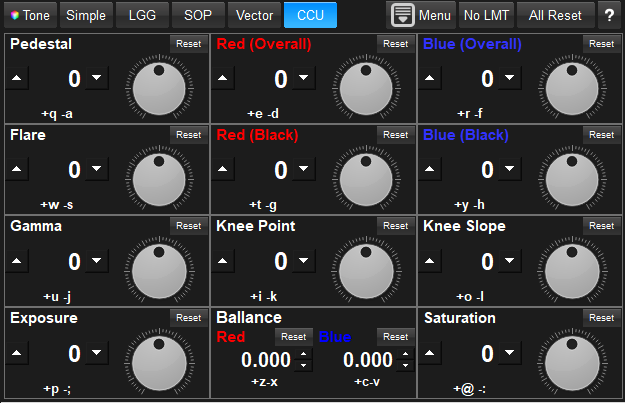 You can select R,G and B for individual tone control. ・You can edit numbers directly. ・You can paste the table edited by spread sheet like Excel. 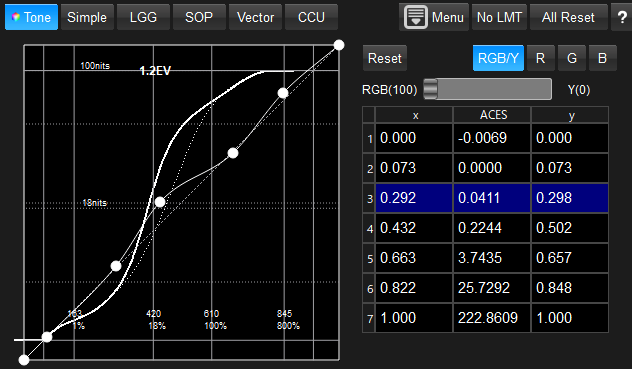 ・RGB simultaneous curve can be mixed with Y component curve. If you increase the ratio of Y component, the change of saturation will be reduced. "Simple" is the easiest to control method. ・Color Balance can be adjusted by big color wheel. ・You can change color temperature by slider. ・Tone control slider make image more harder or softer while keeping the brightness at 18% gray. ・Exposure control change the brightness of the image. It calculates in linear color space so the result was very close to the change of actual camera iris. ・Knee control adjusts the roll off level around highlight. You can change the starting point of the roll off by knee position control. SOP: Offset, Slope, Gamma control. This is exactly the same parameter with ASC-CDL definition, but it is not instinctive control so we prepare LGG mode. Saturation control is common for both mode. 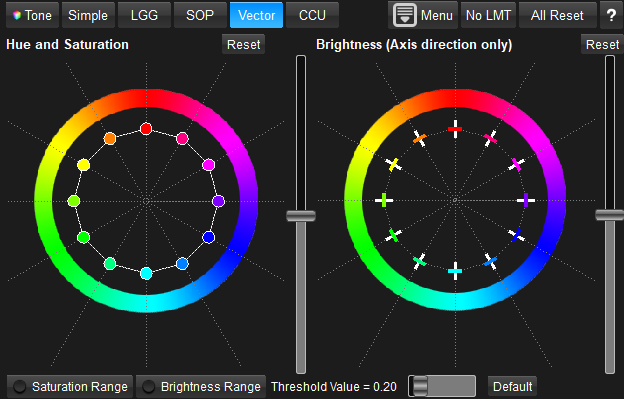 12 colors are located in hue direction, which can control saturation, hue and brightness for each color region. You can device the target of the control into low saturation/ high saturation, and/or low brightness/ high brightness. It is emulated conrol of Camera Control Unit. WonderLooPro provide you the simple method to make white ballance of the image, or matching of the specific color to another by picking the soruce and target color. If you selected proper IDT, these transform will be made in the device independent scene linear color space, so the result will be very accurate like on camera correction. Following screen shot is the example of mis white ballanced one, daylight shot with 3200K white ballance on camera. Very bluish ballance image and red/green/blue wave form shift shows that it is not proper white ballance. The ACES value in the yellow triangle is the average ACES value of red rectangle in the image, 18% gray patch. The numbers also says white ballance was shifted toward blue. 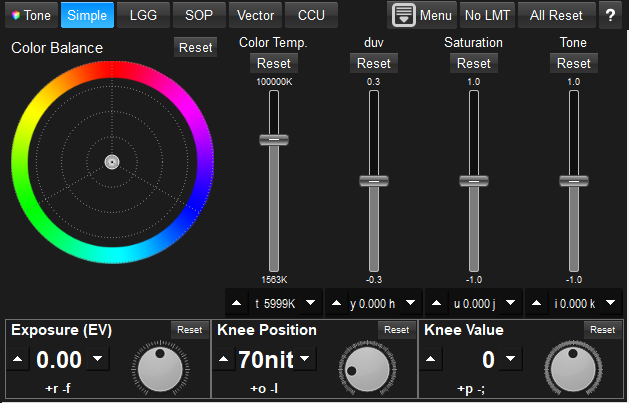 You can just push "Neutralize" button to create white ballance parameter and apply it automatically. The image and WaveFrom shows the white ballance was properly done and the ACES value of 18% gray are all 0.612 which means neutral. This is how simple and accurate WonderLookPro's half automatic white ballance works.